This versatile mirror has integrated touch-key options allowing the mirror to switch from warm to cool lighting, background lighting to help guests find their way at night, high-quality make-up lighting and more! One touch activates an anti-fogging function to prevent condensation on the mirror during and after a shower. It also acts as a sound system when linked with any Bluetooth-enabled mobile device. 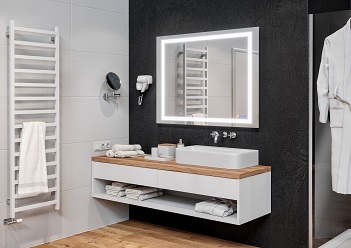 The easy-to-install, IP44-rated mirror comes fully-assembled with a mounting track for installation. Integrated touch keys also make this unit easy to clean and maintain by housekeeping and maintenance staff. With the option to rotate the mirror 90 degrees, it’s the perfect fit for any hotel décor or style. Available in three sizes including 900 x 600mm, 900 x 900 mm and 1200 x 900 mm.